The test period is over, thanks to everyone who participated! I wrote about the benefits of shaving oil last October. I really like using shaving oil. It helps my skin stay more supple and moisturized during the shaving process. This helps me avoid nicks and cuts during my shave, and helps keep my skin soft afterwards. One thing I didn’t like about shaving oil was the price, and after researching common ingredients I’ve decided to do something about it. Here’s how to help me out and try some shaving oil for free in the process. 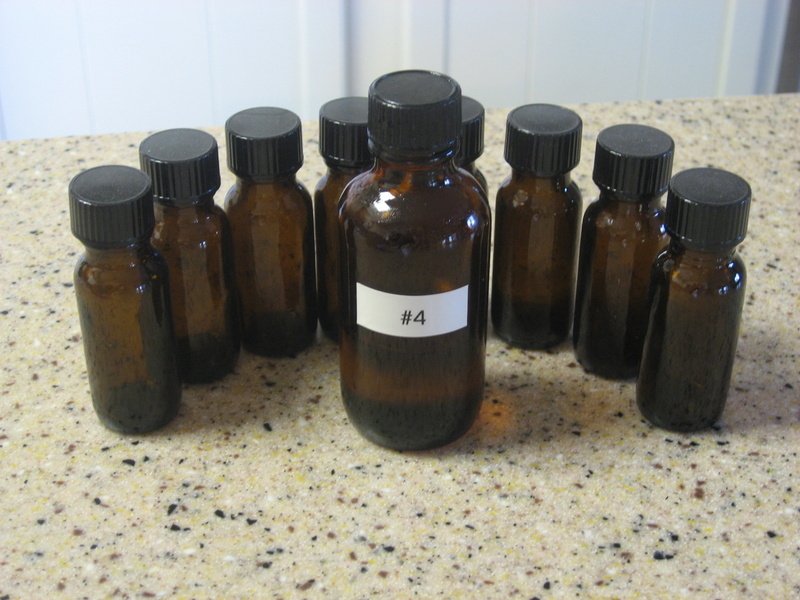 I started making my own shaving oil. I use all natural ingredients, and have been experimenting with the ratio of ingredients and adding essential oils like tea tree oil. The cost for doing this is way lower than buying expensive equivalents from Truefitt and Hill or even more commonly-found brands like Art of Shaving. Yes, there are start up expenses involved like buying bottles, packaging, research, raw materials, etc but even then I think that bringing shaving oil to the masses at mass market prices could be a reality. As you can see, we’re on formula #4 of the pre-shave oil. This works well on my skin before and after the shave. However, I have little idea how it works on your skin. One thing that double edge shaving has taught me is that all sorts of people have different skin types, hair growth patterns, skin sensitivities, etc. For ease of shipping and timeliness, you must be a resident of the continental United States to participate. If I have a second round of testing I may open it up to a larger audience. Please use the shaving oil at least five times. I need your feedback. This will occur in the form of a Web-based survey. Taking the survey will be of no cost to you, and you have no commitment to buy anything after the feedback period is over. You can keep the shaving oil or dump it down your sink. But in order to improve this product I need your honest feedback, even if you don’t like the product. There will be more than enough shaving oil for a test period — usually I put a nickle- or quarter-sized blob of oil in my palm and apply it to my damp face. Even these smaller half-ounce bottles will give you way more shaves than five. You don’t have to be a straight blade or safety razor shaver to benefit from shaving oil. If you use a cartridge razor like a Mach 3 or similar you can still use pre-shave oil. If you’re interested, please leave a comment below, email me at drfaulken@gmail.com or leave a comment on my Facebook page. I will get in touch with you and get your contact and shipping information. 5 Comments on "Help Me Out and Get a Free Shaving Oil Sample"
I would be honored to try this out. Speaking from the point of view as someone who does use the cartridge razors I have been looking for a way to dive into taking better care of my face while shaving and having this to help moisturize before the truly bitter cold of winter sets in sounds like a perfect opportunity. I’d be happy to participate! I purchased Proraso pre/post shaving cream and after reading your other posts I’m wondering if it preps the face or preps the shave. I can double down efforts by helping a friend and researching my own questions. I would love to test some shave oil…I’ve never used any, so it will be a good chance to check it out! I will gladly be a tester. I often use straight Sesame oil. Legs not face.